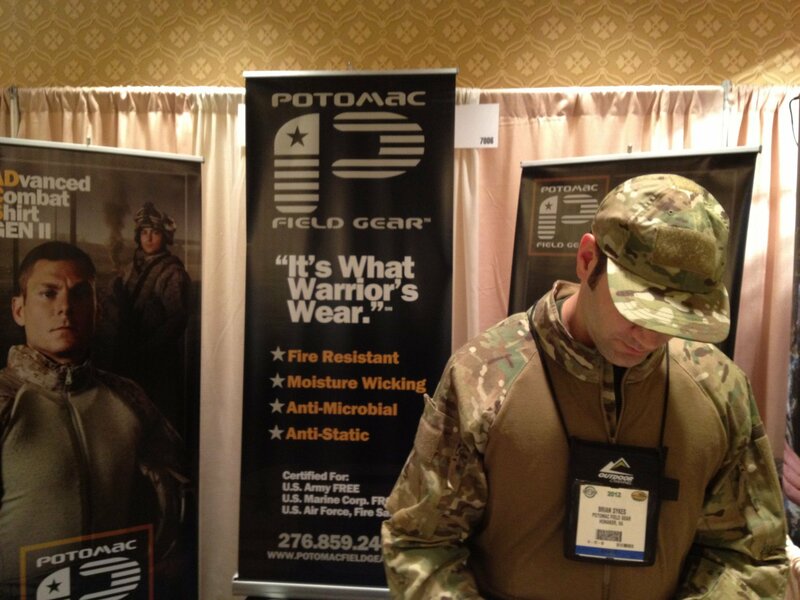 Potomac Field Gear (PFG) Advanced Combat Shirt (ADCS) Gen. II (MultiCam Camouflage): Flame-Retardant/Fire-Resistant (FR), Moisture-Wicking Battle Shirt/BDU with Passive-Cooling Protective Padding and X-Static Silver Fiber-Laced Advanced Protective Fabric (APF) at SHOT Show 2012 (Video!) | DefenseReview.com (DR): An online tactical technology and military defense technology magazine with particular focus on the latest and greatest tactical firearms news (tactical gun news), tactical gear news and tactical shooting news. 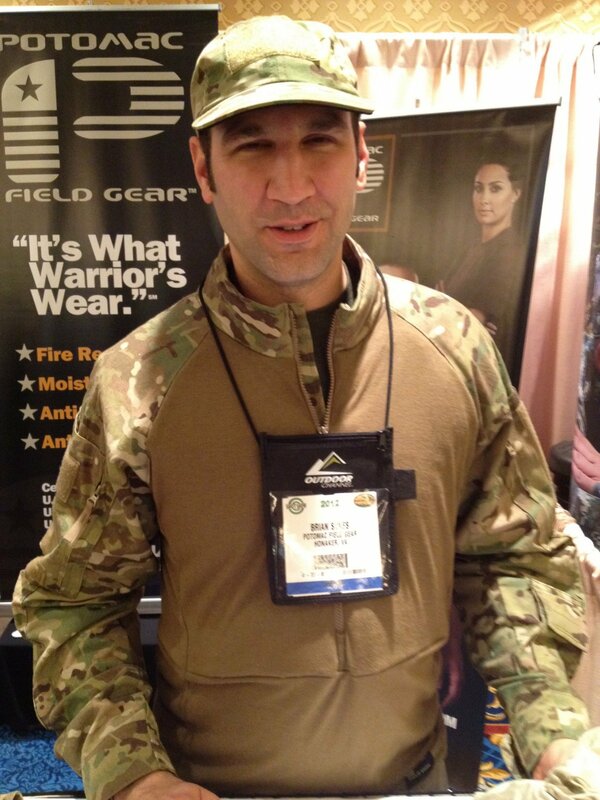 While we were at SHOT Show 2012, DefenseReview (DR) got a quick product demo of the Potomac Field Gear (PFG) Advanced Combat Shirt (ADCS) Gen. II (MultiCam) FR (Flame-Retardant/Fire-Resistant)/no-melt/no-drip battle shirt/BDU (Battle Dress Uniform) from Brian Sykes. 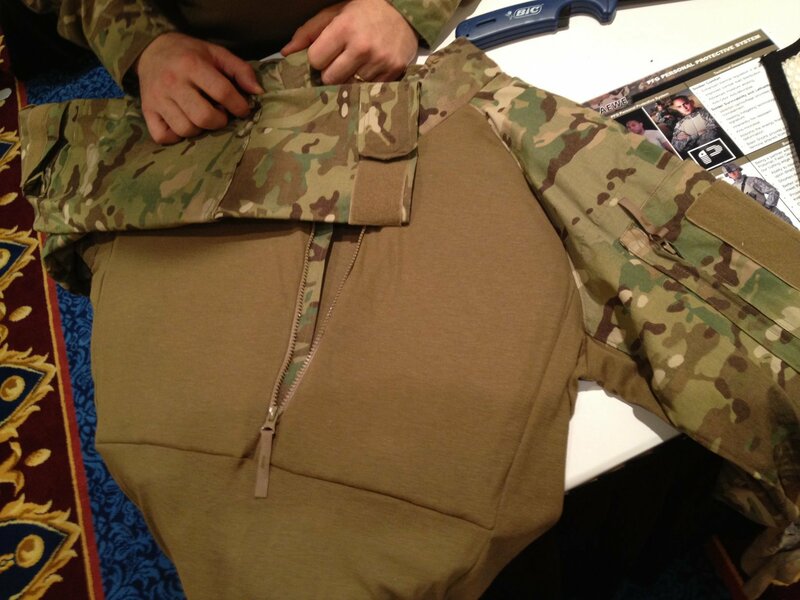 The shirt has a coyote brown central/torso section and Crye Precision MultiCam camo (camouflage) pattern sleeves. 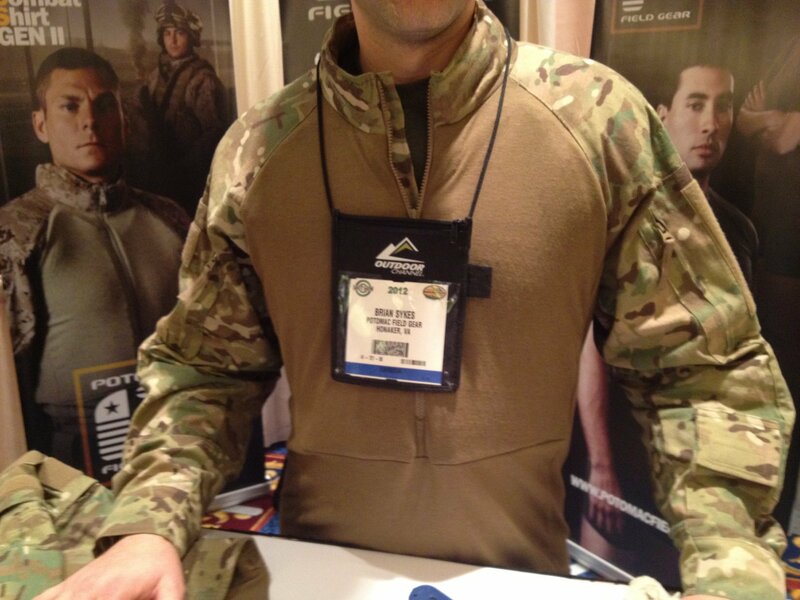 The torso section appears to be made using the same moisture-wicking Advanced Protective Fabric (APF) base layer material as PFG’s short-sleeve and long-sleeve t-shirts. APF fabric is comprised of 82% modacrylic fiber, 9% polyester, 5% X-Static Silver Fiber (anti-static/antimicrobial/anti-odor fiber), and 4% spandex. 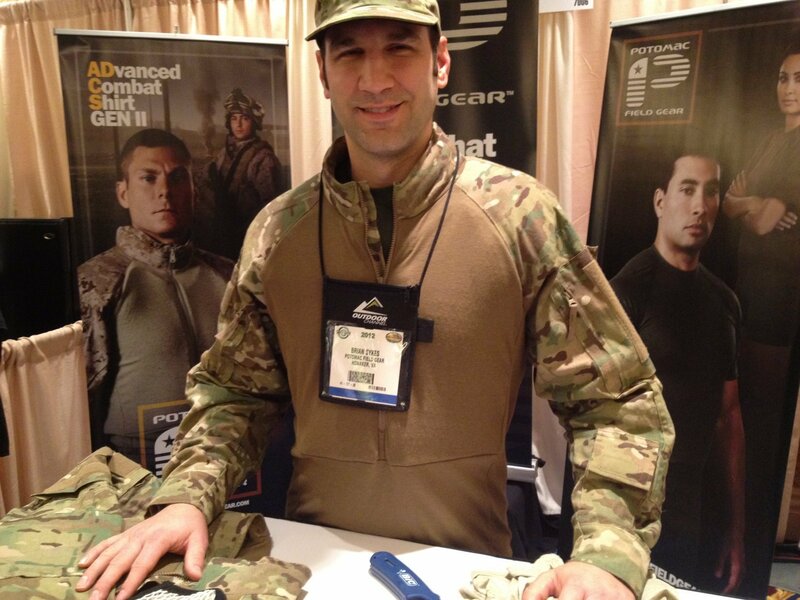 The PFG Advanced Combat Shirt Gen II looks good and incorporates pockets in the chest, shoulders and elbow areas to accept a passive-cooling (passive-air-flow) padding/spacer system for superior air flow, weight-distribution, and, in the case of the chest padding, to provide additional distance and protective padding between the wearers body armor and body for backface deformation signature of the body armor when/if it’s struck by bullets. You can see this explained in the embedded video below. Defense Review has been running a Potomac Field Gear “Sand” (desert tan)-colored FR/no-melt/no-drip lightweight short-sleeve t-shirt since SHOT Show (2012), and we really like it. We recently wore it during a force-on-force CQB/CQC (Close Quarters Battle/Close Quarters Combat) daylight/low-light/no-light gunfighting course using Ultimate Training Munitions (UTM) marking cartridges. The shirt is very comfortable and looks good. 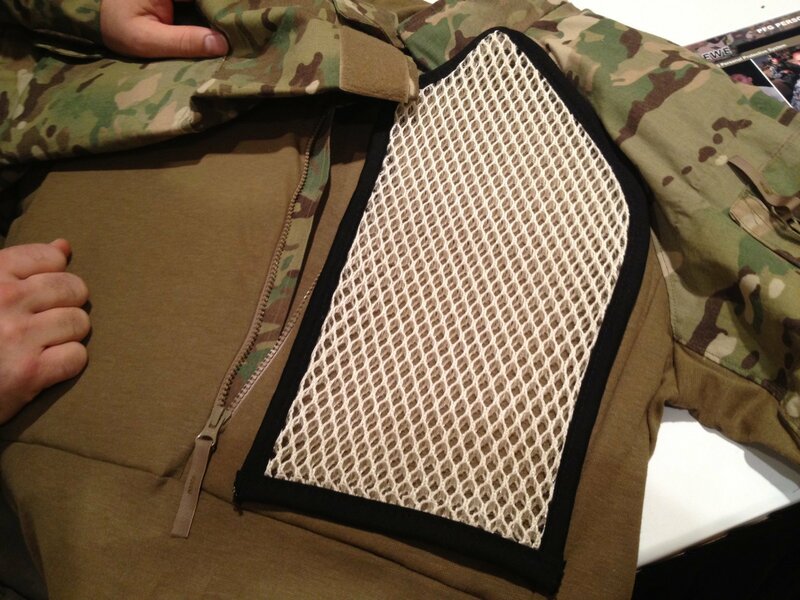 DR doesn’t yet know what material the Crye MultiCam sleeves are made from, but we’ll try to find out. In any case, we’re going to try to get our hands on a PFG ADCS Gen. II as soon as possible, so we can run it through our next tactical shooting and/or force-on-force gunfighting course. DefenseReview is interested in how Noble Biomaterials’ X-Static Silver Fiber stacks up against Schoeller Technologies’ active>;silver and NanoHorizons’ SmartSilver fabric treatments, respectively. Which one’s the best in terms of anti-static properties, antimicrobial protection, odor control (anti-odor), durability and performance through multiple washings (and dryings), feel against the skin, health safety (for the lungs), weight, and thermal characteristics? And, how do they all compare in cost? These are some of the questions that would have to be asked and answered. Next: DARPA/Boston Dynamics “Cheetah” Combat Robot/Robotic Cheetah Running Towards a Future Battlefield Near You: Fast-Running Battle Bot to Prey on Humans?